Customize the layout of your form by using CSS keywords. A few years ago, we released the ability to add CSS Keywords or classnames to your fields to create alternative layouts for your fields and forms. It’s been a great tool for designers who wanted to further tweak their forms’ layout and an easy way for users to take advantage of some of the more advanced CSS rules we’ve built into our Wufoo Form Stylesheet. These keywords work on all fields except Likert Fields. Please note that this feature does NOT update live in the Form Builder. After you specify your classnames, just save the form and you’ll see the classes being applied to your live form and the form in the Entry Manager. We’ve also added a lot of keywords to hide parts of the field you don’t need. 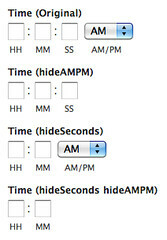 These include hideSeconds, hideAMPM for the Time Field and hideSecondary to remove the Previous link on Page Breaks. You can find detailed instructions on how to use these CSS Keywords along with all the other keywords available to use on your forms in our brand new CSS Keyword Documentation! Filled with lots of screenshots and the most common use cases for the keywords, we think they’ll help you get the most out of your Wufoo forms!